Haridwar and Rishikesh-the twin holy cities that are the most sought-after pilgrimage sites of India-are situated just 20 km from each other in the Garhwal district of the beautiful state, Uttarakhand. The ancient city of Haridwar was formerly known as Gangadwar since it is the first place in North India where the holy river Ganga enters. It is not just one of the 7 important pilgrimage sites of India, but also one of the four sites where the grand Hindu festival of Kumbh Mela takes place every 12 years. Since Rishikesh is nestled on the Himalayan foothills, it is fondly referred to as the Gateway to the Garhwal Himalayas. It is also known as the yoga capital of the world since it is popularly believed that meditating here will get one closer to moksha. Rishikesh has been popular worldwide ever since famous artists, such as The Beatles, travelled here and wrote about it in their songs. For a spiritual weekend, head to the twin religious cities of Haridwar and Rishikesh, which is located at a distance of just about 225 km from Delhi. Haridwar is a holy city that is filled with temples. Mansa Devi Temple is a popular one that is located on a hilltop. It is believed that the temple fulfils all the wishes of the devotees. Other important temples that you must visit at Haridwar include Chandi Devi Temple, Daksha Mahadev Temple, Bharat Mata Mandir, Bilkeshwar Temple, to name a few. Nestled on the banks of river Ganga, Har Ki Pauri is a popular ghat, which literally translates to "steps of Lord Shiva". It is one of the most revered spots since it is believed that Har Ki Pauri is the place from where the river Ganga flows to the plains from the mountains. 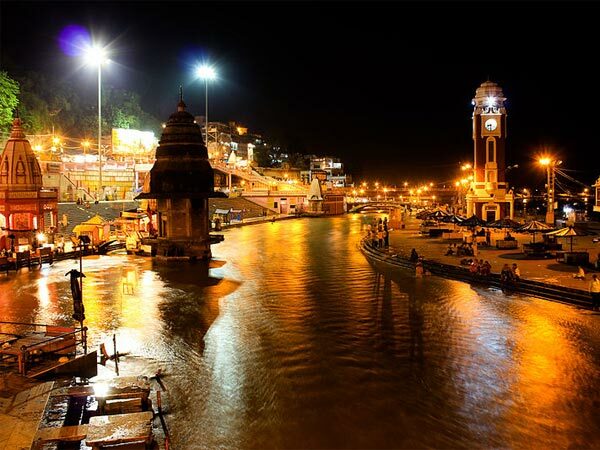 Har Ki Pauri is the place where thousands of devotees gather during the 12 year Kumbh Mela festival. To find myriads of articles of religious significance, visit the bumbling market of Bara Bazaar. Wooden articles, handicrafts and ornamental items are some of the many intriguing things you may buy as a souvenir from Bara Bazaar. While you're here, you can also try peda, which is a popular milk sweet that gets sold like hot cakes in this market. Founded by Goswami Gurudutt in 1943, Sapt Rishi Ashram is one of the most popular ashrams of Haridwar that acts as a Sanskrit learning centre. It is known as Sapt Rishi Ashram, which literally translates to "ashram of 7 sages" since 7 highly revered sages are said to have meditated at the very spot. Rishikesh is known as a popular religious site for a reason. It is dotted with numerous beautiful temples that are visited by thousands of devotees every year. Some of the temples that cannot be missed on a visit to Rishikesh include Nilkant Mahadev Temple, Kunjapuri Temple, Trayambakeshwar Temple, etc. Triveni Ghat is perched on the river Ganga and is a holy site where devotees take a dip since it is believed that by doing so, one can rid themselves of all their sins. Maha Aarti takes place every evening in this site, where devotees offer their prayers. You can also buy items for rituals, trinkets, idols of various gods, etc. that are lined up in the market of Triveni Ghat while you're here. The fabulous landscape of rivers, rocky mountains and clear skies allow tourists to indulge in innumerable adventure sports. The scope for adventure has picked up rapidly in Rishikesh and has become one of the most sought-after adventure sites, apart from being a pilgrimage site. Paragliding, white-water river rafting, trekking, skydiving and kayaking are some of the plethora of activities that are available at Rishikesh.